Bunkie Hostel i La Paz, Bolivia : Boka nu! The cancellation must be done 72 hours before arrival. In the case of No Show the first night will be charge to your credit card. 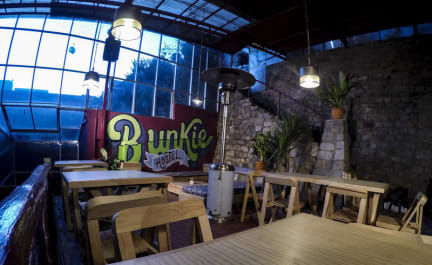 Bunkie Hostel is a new option to stay and enjoy one of the best cities in La Paz. We offer you comfortable dorms with goose feather duvet and pillows, clean private and shared bathrooms with hot water 24/7. Meet new friends, share tips and travel experiences to keep you on the road. 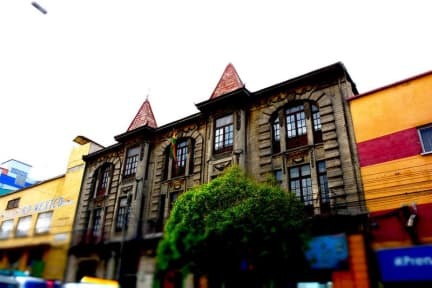 Bunkie Hostel is conveniently located between the bus station and the best and most traditional neighborhood of La Paz (San Francisco Church and Sagarnaga Street.) surrounded by good restaurants, cafes and bars with live music. We are located only four blocks from the Main Square, 10 minutes from the red line of the cable car and around 40 minutes to the airport. The location will allow you to visit the main atractions in La Paz city, the red line (main station) of the cable car station is just 8 minutes walking distance. You won´t miss the witches market and Sagarnaga Street as it is just 5 minutes walking distance from the area the hostel is located. For those who want to visit the historical streets, you can just visit them at 5 minutes walking distance, you don't need to take a taxi and you will find all the main museums close to 'Plaza Murillo'ou have all main museums close to the 'Plaza Murillo'. We offer 4, 8, 10, 14 and 18 dorms! We also have a private room available with double bed. Every dorm has semi-orthopedic mattresses, goose feather duvet ans pillows, as well every bed has a locker big enough to keep your backpack safe. Both shared and private bathroom have hot water 24/7. Taxes not included - occupancy tax 13.00 % per person per night. If you bed is ready before 13:00 you can check-in earlier.